Paramedic talks about the best save he’s ever had, plus his disbelief over what people are able to do to each other. 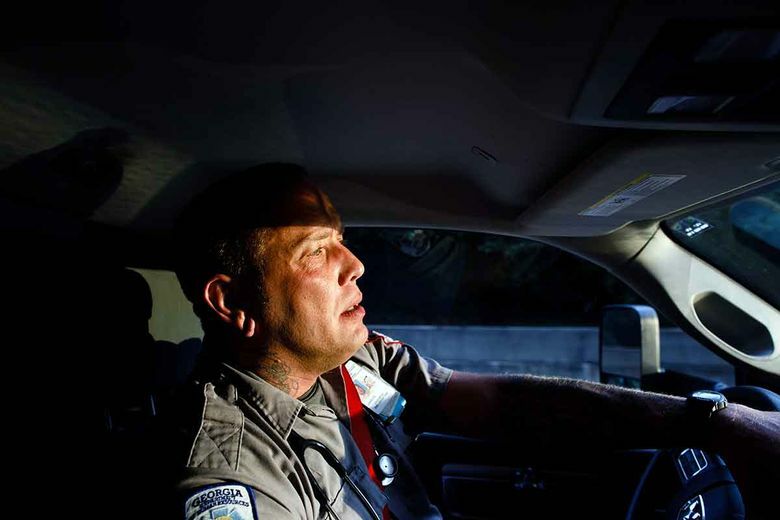 Charlie Rose, 43, is a paramedic at Grady EMS in Atlanta. Q: EMS stands for emergency medical service. What, exactly, is Grady EMS? A: We’re a hospital-based 911 provider and ambulance service owned by Grady Health System. I’m part of the ambulance staff. Residents with medical emergencies in Atlanta call 911, an operator there contacts us, and we respond to the call and transport the person to the hospital. Q: Besides treating patients, do you drive an ambulance? A: It depends on the condition of the person we pick up. My partner, Pete Nelson, is an emergency medical technician. As a paramedic, I have a higher level of training and can administer narcotics such as pain medicine, for example. I’m also trained in cardiology. He drives if someone is in cardiac arrest or has another life-threatening problem so that I can attend to the patient. I drive when the problem is less critical. If it’s a really bad situation and, for example, the Fire Department is present, we can elect to have one of their members ride along and assist us while we work on the patient. A: Three days a week, Wednesday, Thursday and Friday, from 2:30 p.m. to 3 a.m.
Q: What’s it like working a night shift? A: We get the most stabbings, shootings and drug overdoses on this shift. I like the adrenaline rush. I’ve probably seen more things in four years than most paramedics have seen in 10. We learned in training that if we’re dispatched to a location where a violent crime has occurred, we should park a few blocks away and wait for law enforcement to secure the scene. I rarely do that, but I use common sense. If I hear shots, I wait. However, the shooter has probably bolted right away, and if someone is shot in the chest and bleeding, waiting five minutes for the police could be the difference between life and death. The quicker I get the person to a surgeon, the greater the chance they’ll survive. Q: Have you always worked in this field? A: No, I was a tattoo artist, and before that I had various jobs like waiting tables and repossessing cars. I blame wanting to be a paramedic on William Shatner. When I was a teen I watched “Rescue 911,” which he hosted, and saw paramedics saving lives on some episodes. About five years ago, I went to Metropolitan Community College in Omaha and got certified as an emergency medical technician. I worked as an EMT in Omaha while I went back to college for a certificate in para-medicine, and then got the job at Grady and moved here. Q: What job experience has really stuck with you? A: We were en route to a skate park to help a teenager who had a seizure when a 911 operator alerted us that his condition had changed to cardiac arrest. A bystander was performing CPR when we pulled up. We shocked the boy’s heart three times and got it restarted, and two days later I got to talk to him in the hospital and shake his hand, which is unusual. You can only have so much time to bring someone back before the brain is deprived of oxygen. When that happens, there’s often neurological damage, but the teen made a full recovery. It was truly the best save I’ve ever had. Q: After four years at Grady EMS, is there anything that still surprises you? A: What people do to each other, for no reason. I helped one guy who had been stabbed over a hamburger. The lack of humanity is unbelievable.